DIY | White Lies Knits! More Bleach Pen Art Upcycling! Here’s another bleach pen tee hot off the dining room table! I feel so smart rescuing my stained tees this way. And it’s so much fun, I’m kind of hoping I’ll drop something oily on my rack just so I can work on a new bleach design. I’ve thought of doing some other things with the idea this fall such as drawing designs on yardage, then cutting and sewing a dress out of it. The possiblities are endless! I love to collect old buttons, buckles and whatnot and glue them together to make brooches to wear on my coat or jean jacket. They’d be cute on a hat or bag, too! This weekend I was lucky enough to find a bagful of bakelite buckles at a yard sale. I stacked them and glued a button on top of each as shown, then glued on pinbacks. Regular Crazy Glue doesn’t work well in glueing these types of materials (plastics, metal, Bakelite) together, but I found a gel-type Super Glue that is great for little projects like this. It helps to roughen up the surfaces to be joined with an emery board, glue them together, then tiptoe away and don’t disturb the project for a few hours. Every new season I go out and buy at least a couple of fresh Tee shirts. One of the reasons that I do this I’m sure will be familiar to the more buxom among us. It seems that whenever I get a new Tee, it’s only a short matter of time before I spill something oily right on the shelf of my chest and the shirt is now stained; ruined for “good” wear. This is usually caused by salad dressing, spaghetti sauce or undrained hamburger among other culinary culprits. As I was clearing out my Tee drawer this morning, I counted no less than three of these new-ish shirts and thought what a shame it is that I couldn’t save them. Then I remembered a Clorox gel-pen tutorial that I’d seen somewhere on the net. 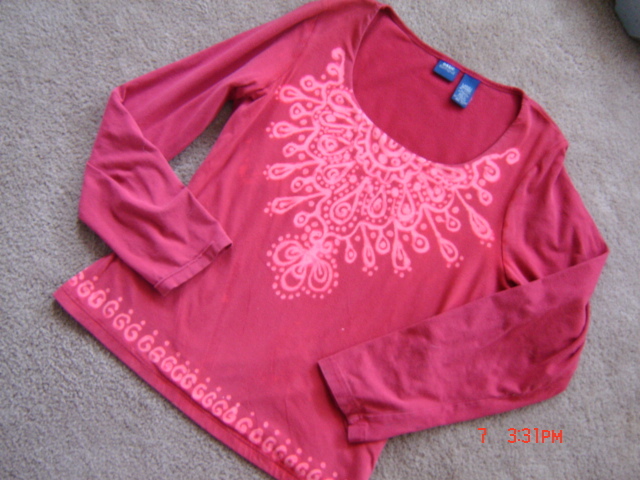 The blogger had used the bleach pen on some stained kid’s clothing and just drew on some simple designs. I thought I’d give it a whirl with the worst of my shirts. The Clorox White Gel pen set me back less than three bucks (got mine at Target) and I used almost all of it to do the design on this shirt. I stuck a piece of cardboard inside so it wouldn’t bleed through and left the gel on for about 20 minutes once I was finished drawing. Then I rinsed it in water and vinegar to stop the bleaching process. Below we have the outcome. I am thrilled! Can’t wait to get on to the rest of my Tees! Just a note: Tutorials that I’ve read say that leaving the gel on until it is completely dry will give a white line, 20 minutes gave it the intensity that you see in my photo. UPDATE: I’ve had many requests to draw up the motif I designed for this. I have a PDF and some simple instructions available in my Etsy shop. 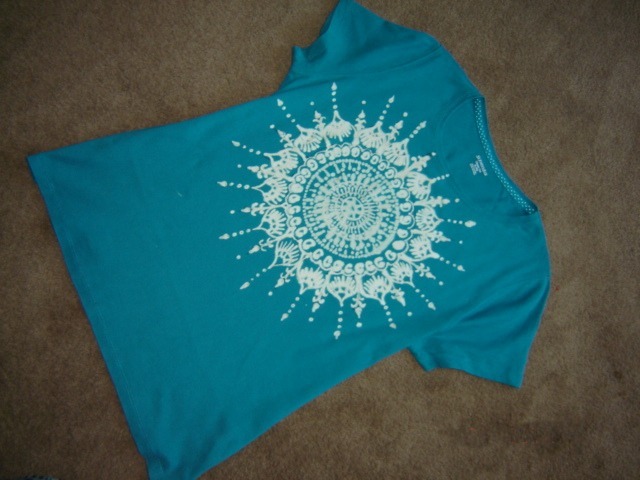 For less than $1 you too can save some tees with this cute Boho motif!